Are you looking for a plug and play entertainment choice for your company or event? Clear Communication- Clearly communicates through positive and concise methods. Knows how to speak coherently and with concrete knowledge. Is courteous to others and understands how to concretely relay messages to others. Obtains correct information and deliver to all parties involved. Know’s how to communicate with performers, clients, and event directors. Understands how to check off tech writers. Organization- Knows how to plan, schedule, coordinate resources, meets deadlines and understands time management. Realizes that both physical and mental organization are crucial in stressful situations. Always keeps the ‘Big Picture’ in mind while organizing micro-macro occasions. Can set appointments, conference calls, create production schedule and relay information to relevant participants & deposits paid. Diverse- Has worked in the stage management, event production and talent side of event projects. Works in both private & corporate environments. Works fluently on a Mac Computer in both pre and post production. Knows how to work in some audio and visual software. Production / Performance variability. Reliability– Is punctual and consistent. Shows up on time and is prepared. Will complete tasks and follow through as required. Is dependable and trustworthy. Expertly does the job as hired. Shows can be customized, curated and executed in Hawaii, the Mainland United States or Internationally. Recent performances include Costa Rica, California and Colorado. I want to take a moment to acknowledge the incredible talent that The Awakened Woman Retreat attracts! Our November event in Kauai was incredible! Kiana Luna serenaded us each evening with lullaby’s and got us amped up each morning with the most high vibrational melodies. She has the voice of an angel and the stage presence of a pro! Her musical repertoire is vast, pulling from her own original works as well as inspirational pop covers. Kiana single handedly set the tone of each gathering and was able to be flexible and versatile in order to fit the groups needs. We adore you Kiana! Later in the week we got to watch in awe as Angela Alessio fiercely embodied the Fire Goddess and had the crowd enthralled by her sensual power and poise. She is masterfully skilled at her craft and is mesmerizing to behold. Angela blended with perfection, beauty and danger in the most captivating way. Her choice in movement and music is a delightful contrast of ancient and relevant. Ladies you are an inspiration! We HIGHLY recommend these ladies for your next event! Elevate Enterprises was a true pleasure to work with! Professional, talented, enthusiastic and kind. 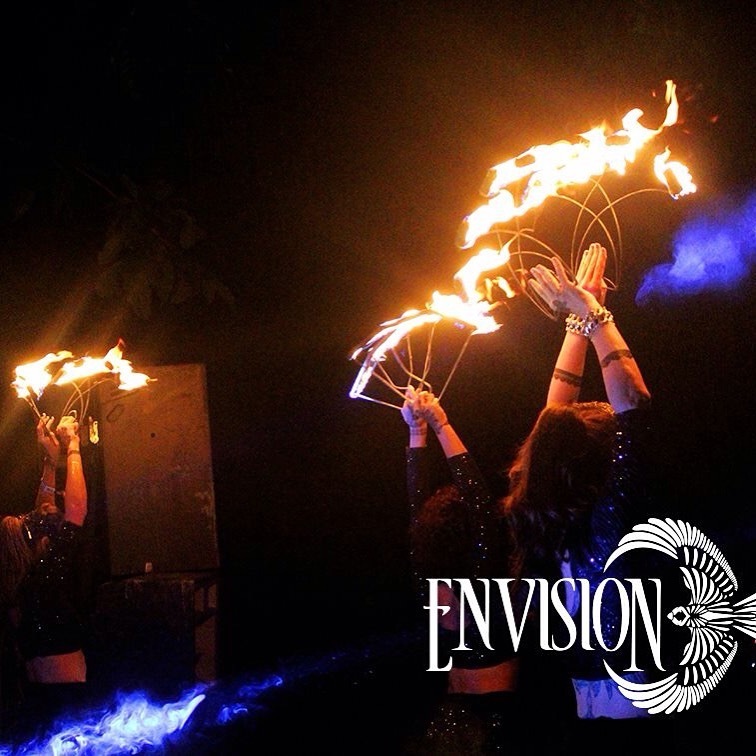 I was really pleased with the work they brought to Envision festival and how easy it was to work with them. Angela’s performance at our wedding was one of a kind! We had an incredible night up until that poin, but once Angela came out and performed, I think it was like an exclamation point on an already epic day. We can’t thank her enough for how amazing it was to have her be apart of our special day. I still have people that attended the wedding bring it up years later. If you are considering working with Angela, I highly reccomend it, she’s extremely safe and professional, gauranteed you’ll be happy you decided to work with her.